A soldier or neutron moves in a straight line (orthogonal or diagonal). It must move as far as it can; so it continues until it finds an edge or another stone. Each player first moves the neutron, then one of his soldiers. On the first turn, the first player does not move the neutron. to their home rank (the first rank on their side of the board). 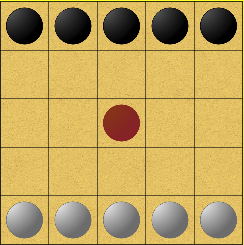 Other way to win is stalemate the opponent, so that he cannot finish his turn.